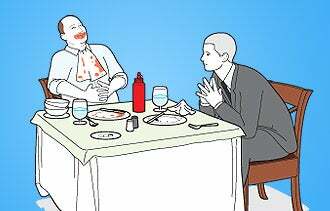 The business lunch exists so that two people may converse about business matters (which is a meeting), while doing something they had to do anyway (which is eating). It is formal, yet it is human. It is committal, yet it is noncommittal. It is awkward, yet it is tasty. The business lunch is a paradox. We'll assume you're meeting your counterpart one-on-one. And we'll assume the other person is, pretty much, a stranger. And we'll assume you're the one who is in need: of money, of a partnership, of a contract. You're the one pitching, and you've made the invitation. You should make the invitation, but it may be a bad idea: Because the business lunch is more lunch than business. The invitee can request a downgrade, like a meeting in their office. Or meeting for coffee. So throw the lunch out there, but keep in mind: It's a bold move. "My philosophy is that lunch is not the most productive place to do business," says Eric Manlunas, a managing partner at Santa Monica, Calif.-based venture capital firm Siemer Ventures. "I like to invite people in for a meeting in the office, in the conference room. If the idea is something we like and we believe we can get comfortable eventually investing in, then we may have lunch. Lunch means they've made it through the first filter." The point is, whether at the first meeting or the second meeting, if you get someone to agree to lunch, you're in. You might be out by the time the flourless chocolate cake is served, but for at least the first hour or so, you're in. The choice of restaurant is crucial. The place should be clearly convenient for the other person. It should not be in some sort of middle ground--it should be a place the other person need not travel far to get to. The message should be clear: For the purposes of this meal, the other person is to be catered to--even before the lunch starts. It helps if you've been there before. Because if you've been there, you know how you'll be treated. You want a place that understands service. And good service as it relates to the business lunch is a place where you're seated immediately and tended to immediately. "If a guest needs a lot of peace and quiet and no attention, then I need to seat that person in an area that's away from everyone else in the dining room, and I need to make sure my service person knows they don't need to provide a lot of attention to the table in terms of social interaction," says Richard Coraine, senior managing partner at New York-based Union Square Hospitality Group, which operates restaurants such as Gramercy Tavern, Union Square Cafe and Shake Shack. "The more we know about what you need, the better we are going to be at exceeding your expectations." Ask yourself if the restaurant you're going to is looking to exceed your expectations. That's the kind of place you want. Service-oriented places are used to specific requests. They welcome them. Says Coraine: "The more the assistant can tell us ahead of time, the less intrusive we have to be. We don't have to try and figure out what your agenda is. So if your assistant says you want a quiet table and you want to sit by the window, it's great for us." You want a four-top. You want to sit next to each other, around one corner. The worst way to have a business lunch is to sit directly in front of the other person--all that eye contact is a little awkward, and you might have to talk loud enough that other people can hear you. The corner is a little intimate, sure, but lunch is an intimate thing. The key with corner seating is that it allows you to avoid the awkwardness, and it facilitates discretion. Which is occasionally important. Before your counterpart arrives, you want to order some sort of beverage and scan the menu. You want to look around, you want to get comfortable and you want to be ready to receive your guest. The other person has the upper hand (since you're the one who needs something, and this place may be a place the other person suggested), but by getting there early, being seated early, getting a good table and deciding what you'll have--by being relaxed--you've made this place your place. The lunch part is easy. You eat, you talk. The business part is a little trickier. Because lunch is mostly about socializing and not business, it might help to wrangle your pitch into something that can be delivered quickly and then dispensed with. Says Jared Goralnick, founder and CEO of AwayFind, an e-mail productivity app: "Lunches are more about furthering the relationship than they are about furthering the deal. If I'm calling a lunch, I have a goal, but that goal is small, and it might be a five-minute thing. The rest of it is making them comfortable with that five-minute thing or making them comfortable just being around me." You go to the place, you order the food, you do the pitch and then you have an actual conversation with an actual human being--about business or not. What the other person wants to see is someone who is comfortable being around a potential new business partner and to confirm that you and your business are as interesting as they initially thought. You can relax. You can have an interesting conversation. You can have an interesting meal. If, after you've done your five minutes, they want to bring up the business again, let them. The best part about the business lunch is that it forces us to do something we don't do enough in our professional lives: be ourselves. And eat at a table for more than 15 minutes. But mostly, be ourselves. No sandwiches involving red sauce. But never pay with a coupon or gift card. Or change from the petty-cash drawer. Say "appetizers," not "apps." At a business lunch, it might not be immediately apparent which kind of "app" you're referring to. "Guac" presents no such confusion. you are talking too much. If your plate is at least one-third emptier than the other person's, he or she is talking too much. If your plate is at least one-third larger than the other person's, you have ordered the Admiral's Feast. If the other person checks their watch, immediately ask for the check. If the other person checks their drink, immediately order them another. If the other person checks their pulse, immediately ask for an ambulance. And maybe refine your pitch a little. Monthly employee-recognition birthday cake time! Make it if you can! Monthly employee-recognition birthday cake time. Mandatory.